AW Modeler is a WIPL‑D front‑end for easy modeling of 3D objects and is particularly well suited for planar structures, such as microstrip. A 3D object can be interactively created and edited by a simple mouse point-and-click action to select the relevant points from a user defined grid. The object can be composed of wires and planar polygons with arbitrary number of vertices. A planar polygon can be associated with a thickness to simplify the modeling of a finite metallization thickness. A grid can be uniform or non‑uniform and can be specified using symbols when parametric definition of the model structure is required. In addition to the possibility to create the simulation model using AW native editor, a DXF file can be imported to AW Modeler and edited if necessary. AW Modeler automatically generates vias, radial stubs, circular patches and feeders as separate entities. Simulation models created by AW Modeler are automatically converted to WIPL‑D projects for further analysis and optimization. AW Modeler automatically meshes all polygons, vias, metallization, etc. as appropriate for WIPL-D Pro modeling. Manual meshing the structure is not required..
Model of Log‑Periodic Dipole Antenna with the 52 printed dipoles was created in WIPL‑D AW Modeler and then simulated using WIPL‑D Pro. 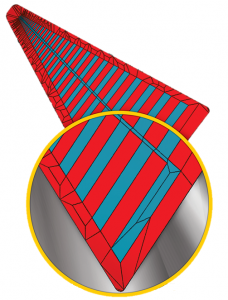 As the antenna is symmetrical, the symmetry can be exploited to halve the size of the problem. The edge manipulation was applied to accurately model the current singular behavior at conductor edges. All of the other simulation control parameters were kept at the default values. The entire antenna is approximately 261 mm long and it is placed 4.25 mm away from the metallic circle with a diameter of 248 mm. The longest arm of the antenna is approximately 76.2 mm long and length of the shortest one is around 1.53 mm. 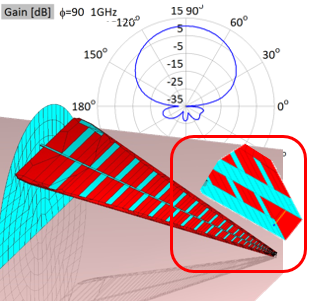 The simulation times and a number of unknowns required for simulating LPDA antenna at several operating frequencies in the frequency range from 1 GHz to 18 GHz, are presented in this application note. The simulation hardware was a standard desktop PC empowered by low-end Nvidia GPU card. WIPL-D proprietary GPU solver was used to speed‑up the matrix inversion.